The Mom will show you the tricks to layering with your Cricut. You will benefit from this class whether you have the Original, Create, or Expression machine. We use the Mickey and Friends and the Mickey Font cartridges, because I am such a Disney fan. But, the class is all about the technique, so join us for some fun! All materials provided. Below is the student supply list. Don't worry if you don't have these items, as we can share (except adhesive). Also, items available for purchase at a discount. Please call ahead so your class kit is ready. Bring the Mickey cartridges if you have them. Don't worry if you don't, I have extras. In this class you will cut on multiple media. You'll learn how to: make a stamp, a magnet, an embossing folder, and stencils, etch glass and cut chip board. 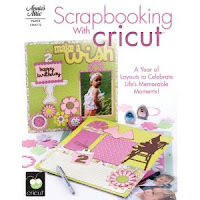 Cricut 101, although not mandatory, is recommended prior to taking this class. Remember, the 101 class comes with Mom's personal guarantee. 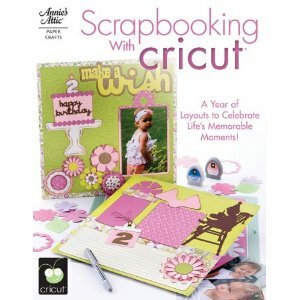 Regardless of what you know or how long you have had your Cricut, you will learn enough in my Cricut 101 class to get your money's worth. If you feel like you didn't, I'll credit the fee toward another class. You have nothing to lose! So, take the 101, then come to the Advanced class to play with all the fun materials. Doesn't matter which machine you have, the Original, the Create, or the Expression, you'll have fun and learn so much you'll want to run home and put your new skills to work. Don't worry if you don't have these items, as we can share (except adhesive). Also, items available for purchase at a discount. Please call ahead so your class kit is ready. One offer is, loosely quoted: A Cricut machine never used. It will include two cartridges (George and Basic Shapes and Tags, Bags, Boxes and More), a Cricut Traveling Bag on Rollers, extra blade, and a bunch of other new goodies to go along. Another customer bought 2 Going Places cartridges and is selling one. Just let us know if you are interested and we'll help you get together. We're all at the Cricut Swarm and having a Cricut good time! Tamara's playing and sharing her 53 cartridges! She may get the most cartridges in your rolling tote award. Although, Mz O is giving her some stiff competition. Cathy made her first Cricut card! Check out this adorable watering can, made by Kathy. She used some tricks The Mom taught her and added some of her own! Come join your Cricut-happy friends for challenges and to swap ideas. We signed up with Provo Craft and started our local Swarm in 2007 and have been having fun ever since. Dive into cartridges for hidden treasures and learn from the best. There is no fee for this event! Bring your machine and your cartridges and whatever you would like to work on. The Mom will be available to answer any Cricut, Design Studio and Gypsy questions. We are all set up in the new HUGE crop space and ready for you to choose a table and spread out. 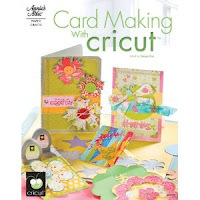 We also have the Card Making with Cricut book. Some amazing samples for you to case! Give us a call if you want to reserve yours.